Homemade ravioli are my specialty. I love to serve them at dinner parties and delight my guests with those parcels of delicate pasta with a scrumptious stuffing. 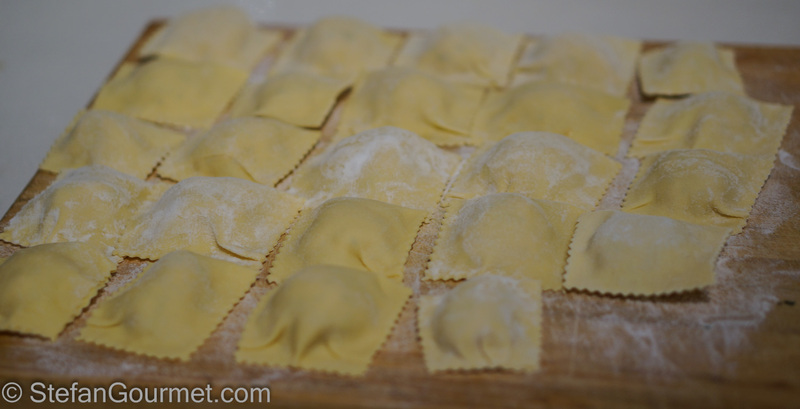 The keys to good ravioli are to make the pasta as thin as possible, to make sure the parcels are closed tightly without any trapped air, to give the stuffing an interesting texture, and to slight over-season the stuffing. 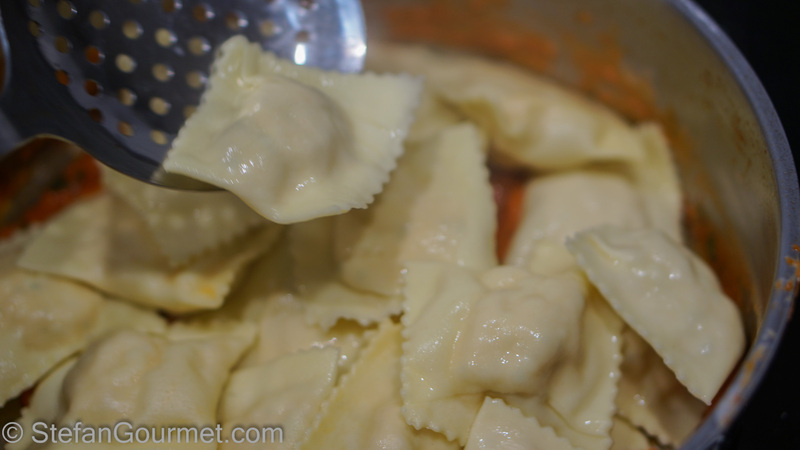 Good ravioli hardly need a sauce — some extra virgin olive oil, some melted butter with sage, or a simple thin tomato sauce will do. 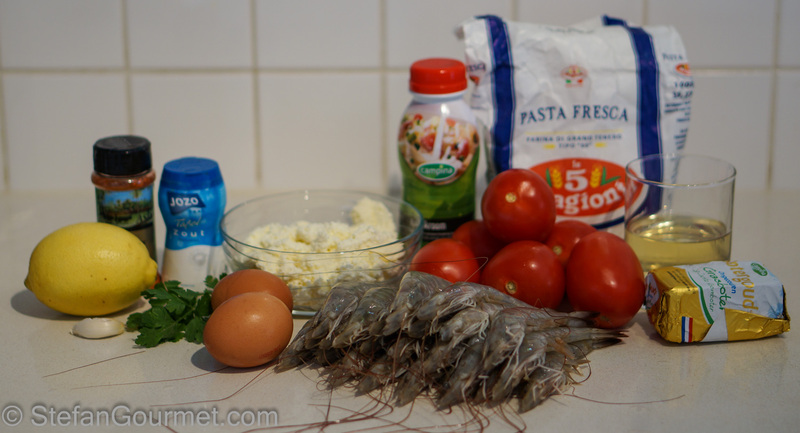 I had made shrimp ravioli before, but the last time was before I started blogging (so more than three years ago). 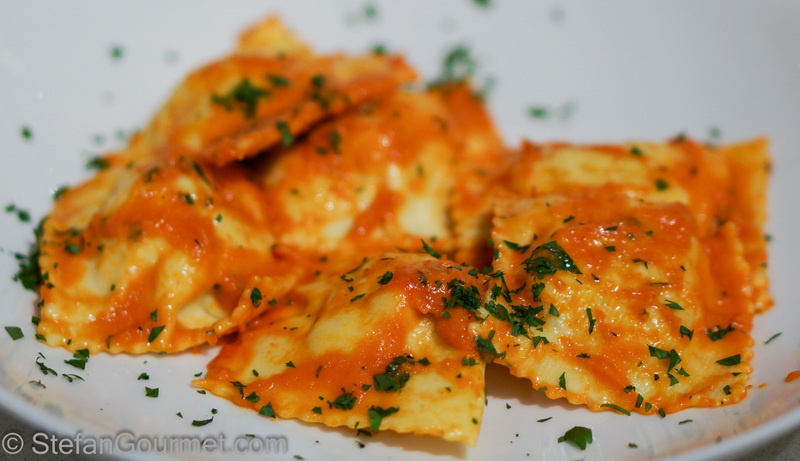 These shrimp ravioli are served in a pink sauce: a tomato sauce with cream. 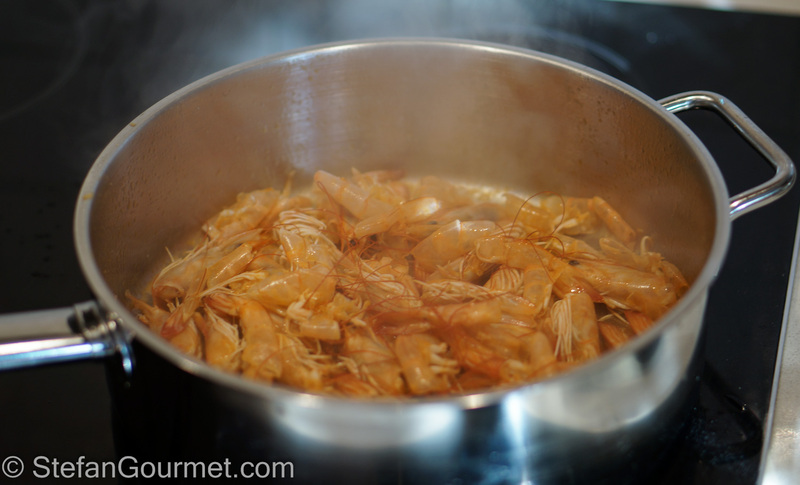 All of the flavor of the shrimp goes into the stuffing, as the heads and shells are turned into a stock and then reduced to a shrimp ‘syrup’ that is added to the stuffing. 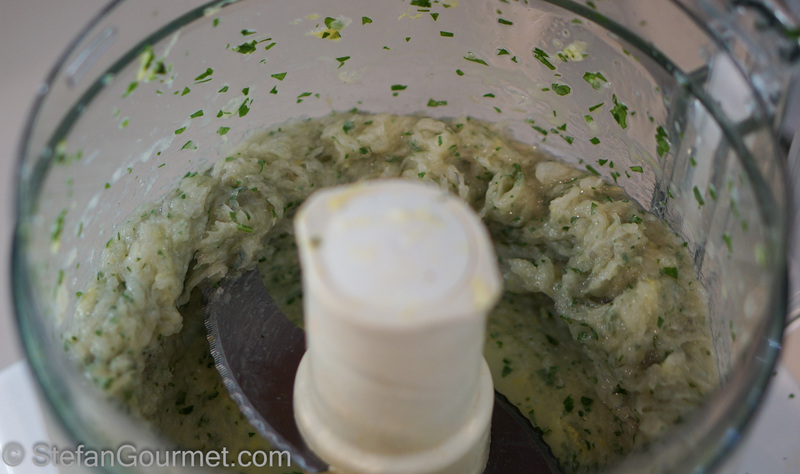 The balance between the flavors in the stuffing (lemon zest, cayenne pepper, salt, shrimp syrup, shrimp, thyme, and ricotta) is important. 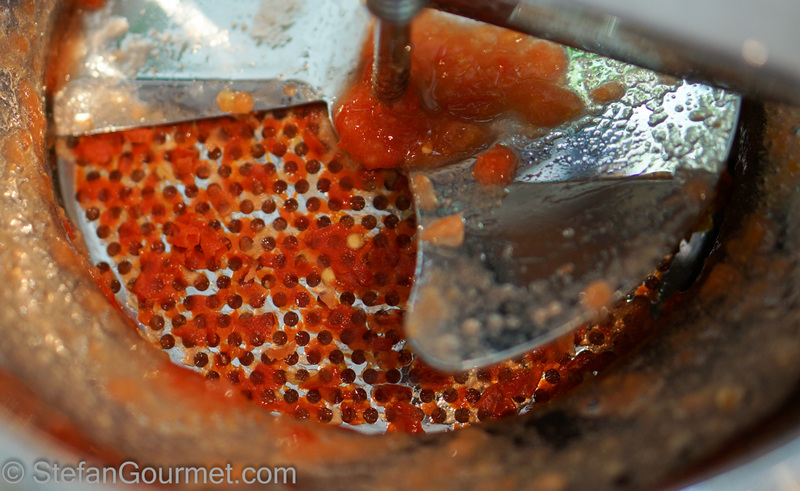 If all goes well, it will become one new multi-layered flavor rather than tasting the individual elements. The texture of the stuffing of these shrimp ravioli is so light it is almost fluffy and it has a delicious elegant flavor. 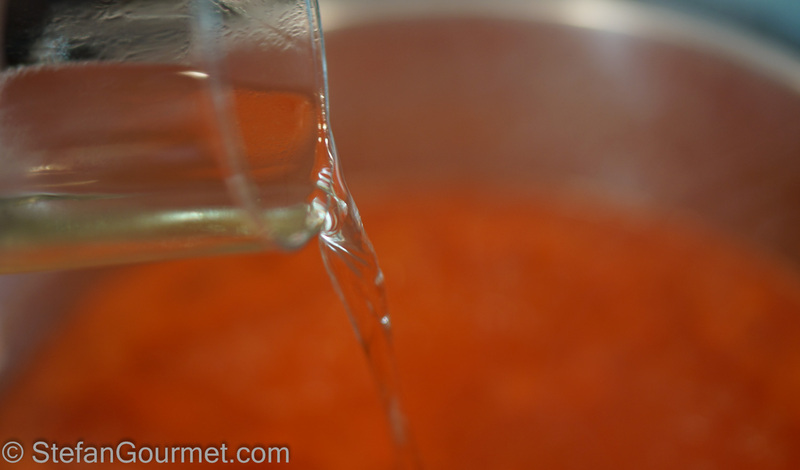 Start by making the shrimp syrup. Peel the shrimps, reserving the heads and shells. 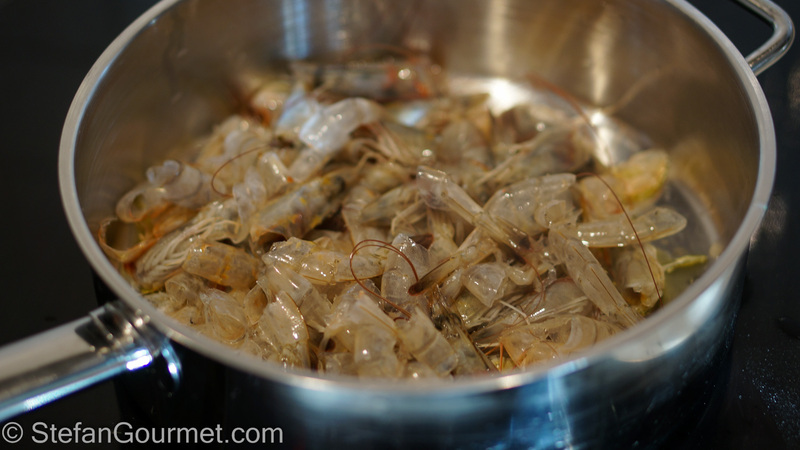 You should end up with about 250 grams (9 oz) of shrimp meat. Refrigerate the shrimp meat. Heat 1 Tbsp olive oil in a frying pan and add the heads and shells. Sauté the heads and shells until they are pink/orange. Cover with water. 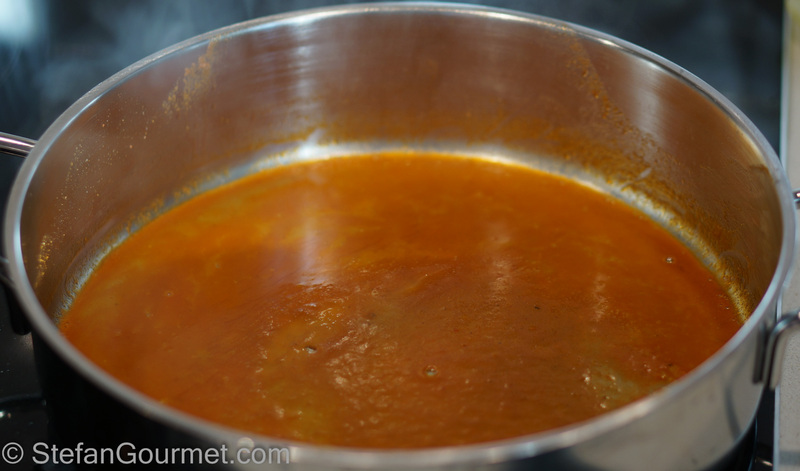 Bring to a boil, then reduce to a simmer and cook for 20 minutes. 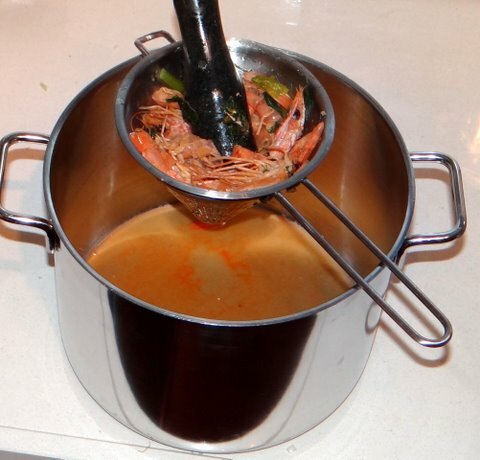 Use a ‘chinois’ (pointy metal colander as shown) and a pestle to filter the stock and get as much juice out of the shrimp heads as possible. 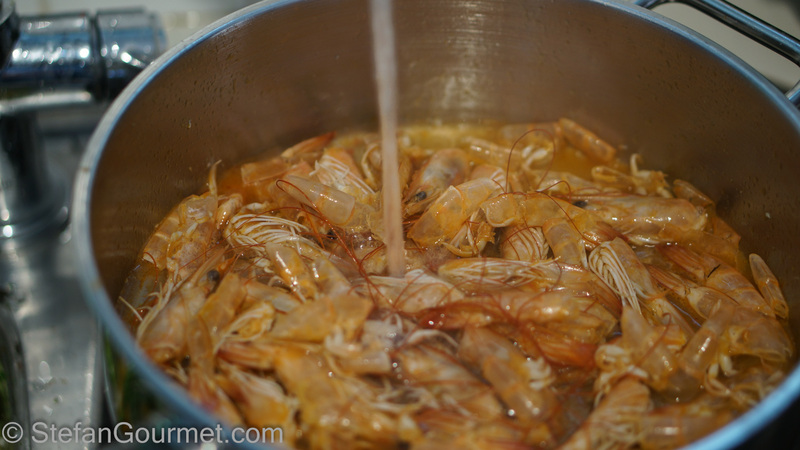 Put the shrimp stock in a wide shallow pan. Bring to a boil, then reduce to a simmer. Simmer until reduced to a thick syrup, stirring now and then. Make sure it doesn’t burn! Turn off the heat. Now make the stuffing. Start by beating 1 egg. 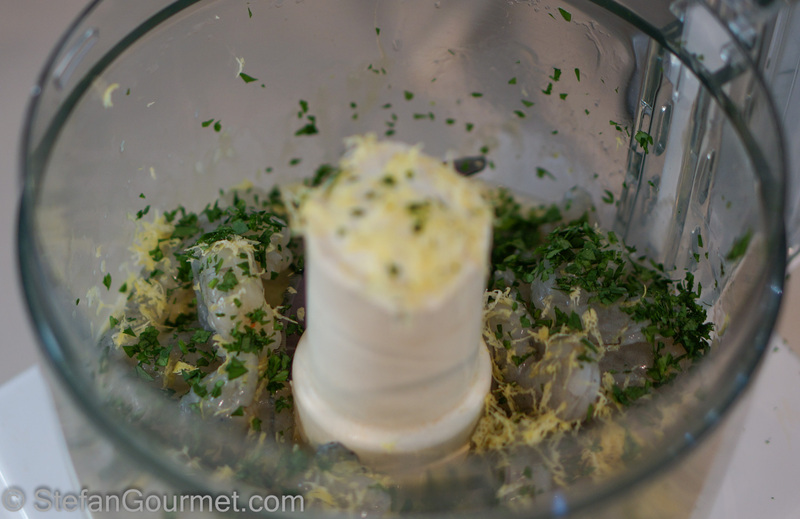 Add shrimp meat, 1 Tbsp fresh thyme leaves, and the zest of 1 lemon. 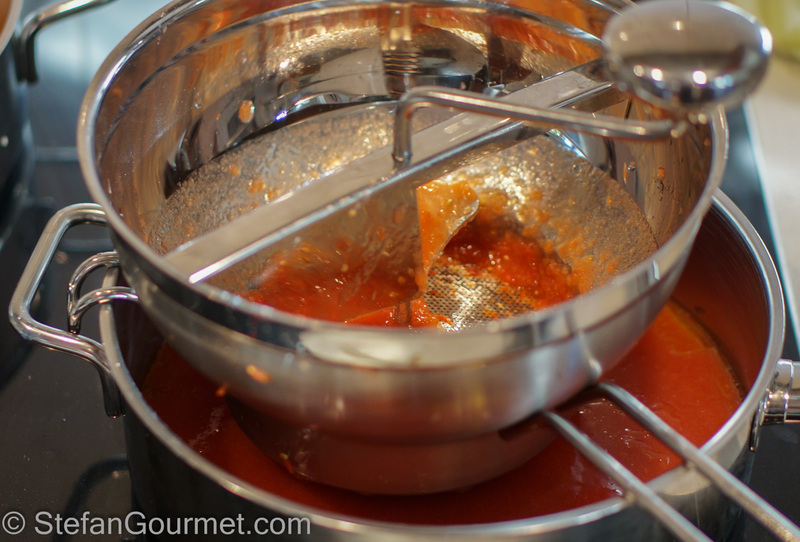 Process to obtain a smooth puree. 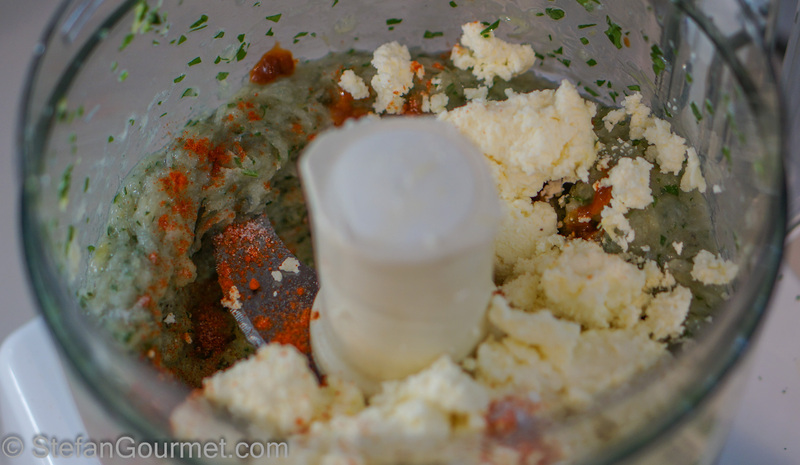 Add the ricotta, salt, and cayenne pepper. 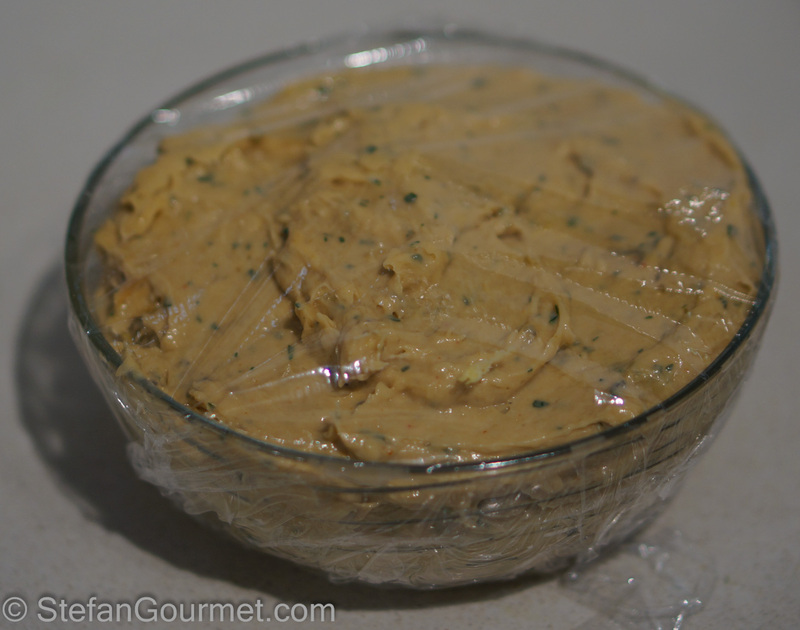 Transfer to a bowl, cover with plastic wrap, and refrigerate the stuffing for at least an hour to firm up. 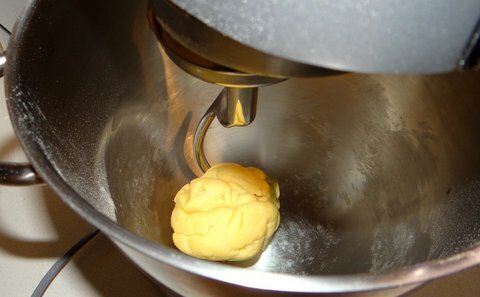 Make pasta dough from 2 eggs and 200 grams 00 flour according to my instructions, wrap it in plastic foil and allow it to rest for 30-60 minutes. Meanwhile, prepare the pink sauce. 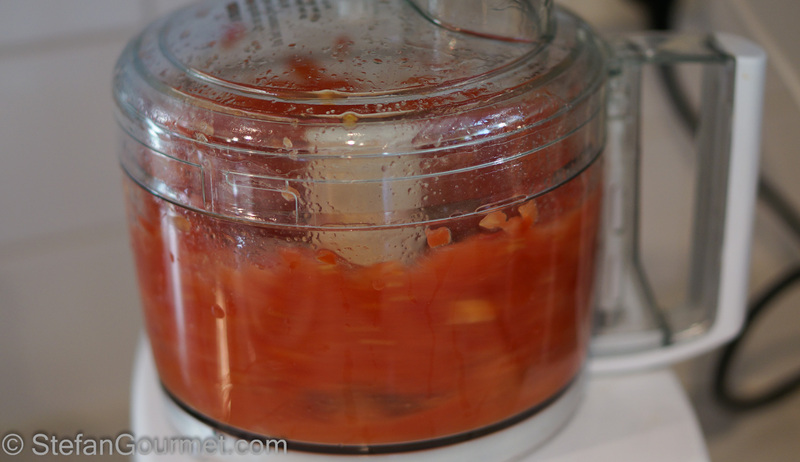 Put the tomatoes in the food processor and process to a puree. Use a food mill fitted with the coarse disc to remove most of the seeds and skin. Melt the butter in a frying pan. 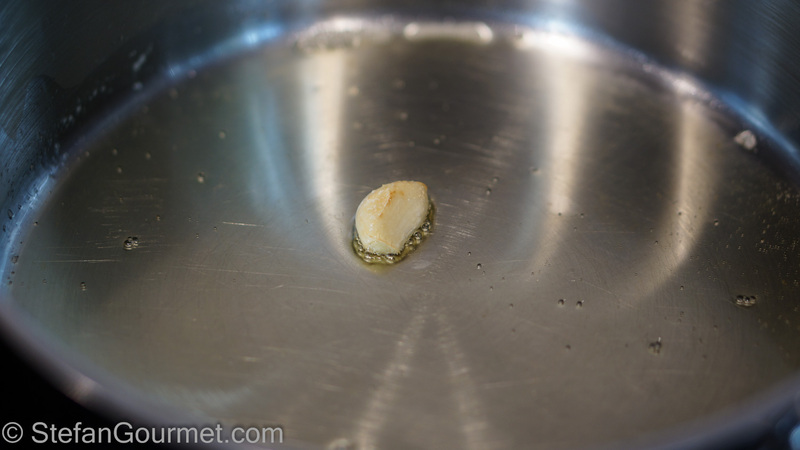 Add the garlic clove and cook it until it is golden on all sides. Regulate the heat so you don’t burn the butter (or the garlic). This is easier with clarified butter. Discard the garlic. 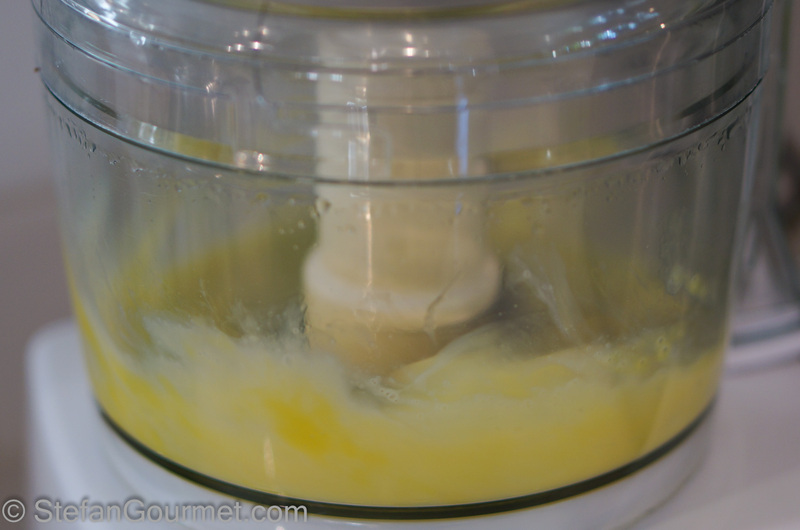 Use a foodmill fitted with the fine disc to add the tomatoes to the garlic-infused butter. 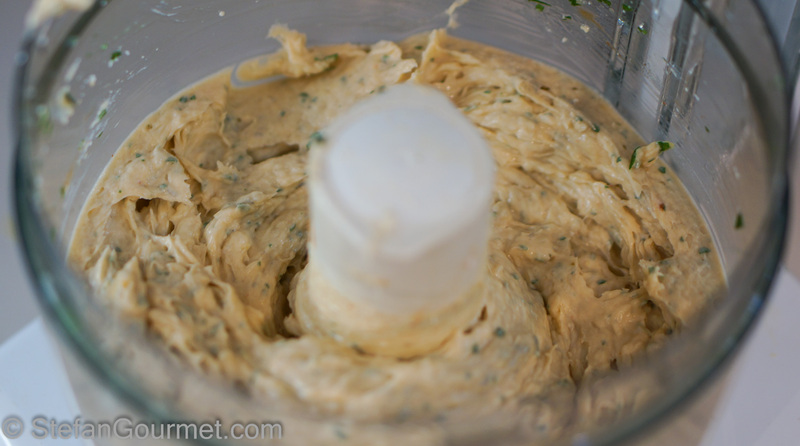 Add 80 ml (1/3 cup) dry white wine as well. Season with salt. 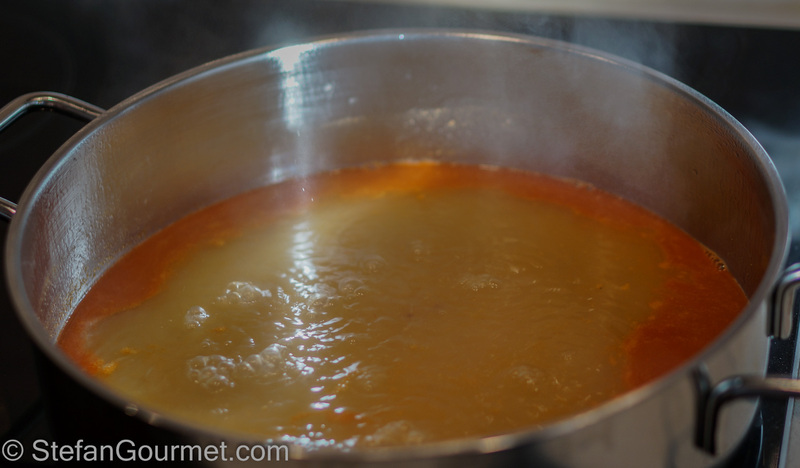 Bring to a boil, and then reduce the heat to a simmer. 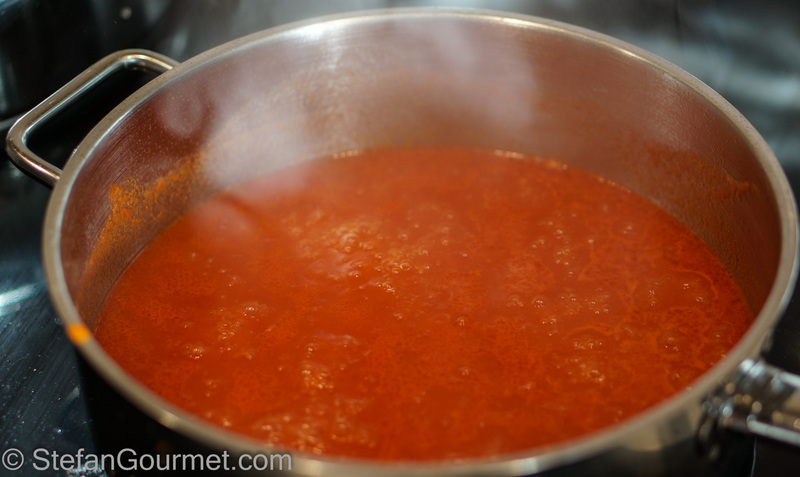 Allow to simmer over low heat until the sauce is no longer watery. Taste and adjust the seasoning with salt. 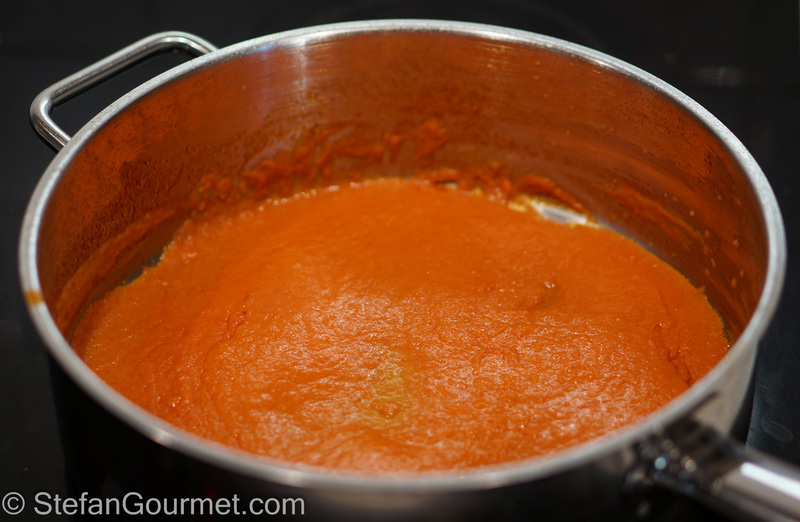 Keep warm over very low heat (add a tablespoon of water if the sauce becomes too dry). Bring a large pot of water to a boil. Meanwhile, roll out the pasta dough to the thinnest setting and make ravioli stuffed with the shrimp stuffing according to my instructions. 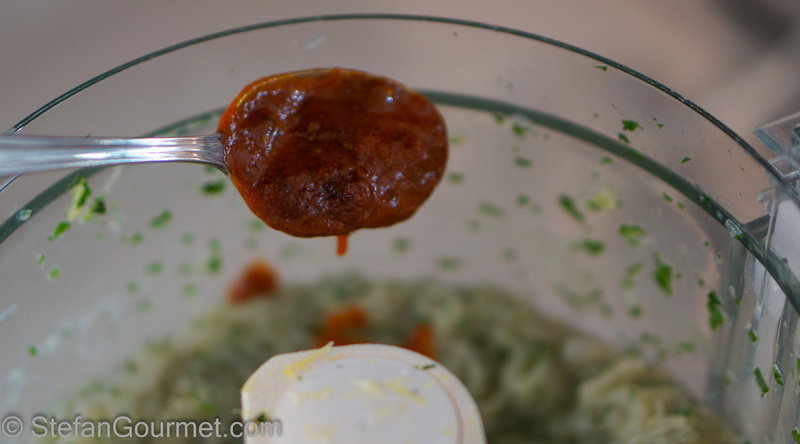 Add half of the parsley and carefully toss the ravioli to cover them with the sauce without breaking them. 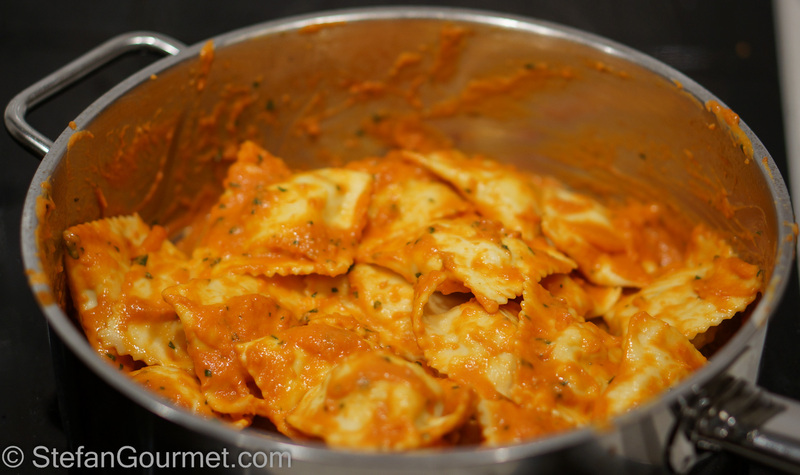 Serve the ravioli on preheated plates, sprinkled with the remaining parsley. This needs a dry Italian white with a good balance between roundness and freshness to go well with the pink sauce (i.e. 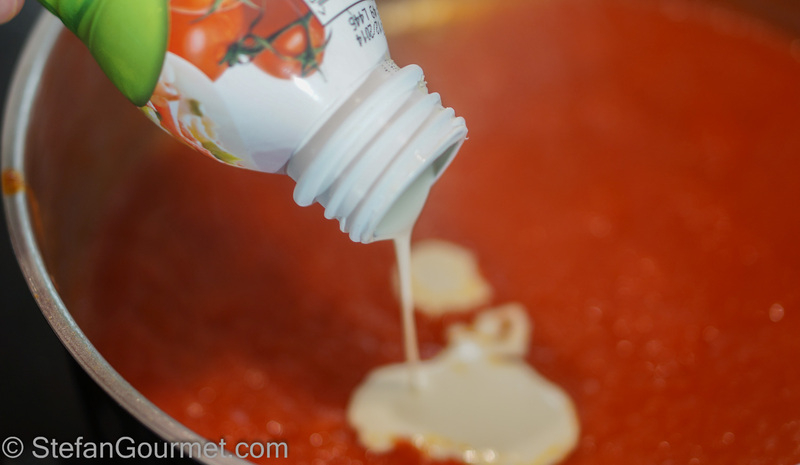 the freshness/acidity of the tomatoes and the roundness/creaminess of the cream). We enjoyed the ravioli with a Ferentano from Falesco, a slightly oaked white from the roscetto variety from Lazio, which was an outstanding match. Two years ago I compared pan-seared wagyu flank steak with the same wagyu flank steak cooked sous-vide first and then seared. Wagyu flank steak cooked 48 hours at 55ºC/131ºF first is still pink, but turned out to be much more tender than the steak that is simply seared. Lovely shrimp ravioli! I envy all your cooking gadgets! 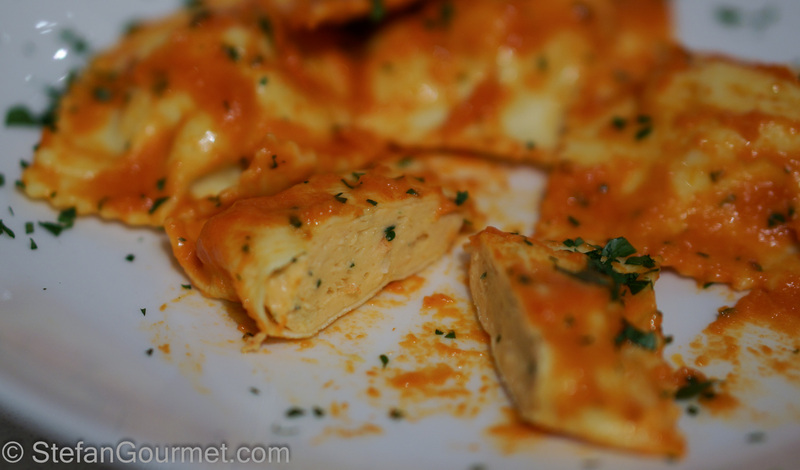 Your ravioli are always gorgeous. This shrimp filling sounds wonderful. It’s funny but I haven’t made fresh pasta or ravioli in years. I think I got burned out on making it because I made it a lot when I cooked for a family for 8 years. But that’s so silly because it’s so easy. But I do love dried pasta as well.. Fantastic! Have not made ravioli with seafood, prawns or whatever for ages . . . ricotta will be bought but cannot wait to enjoy 🙂 ! Hi Jules, great to hear it turned out well. Yes, you can freeze ravioli. Freeze them on a sheet tray in a single layer, and then when they are frozen you can put them into a plastic bag (this method prevents them from sticking together and loosing their shape). 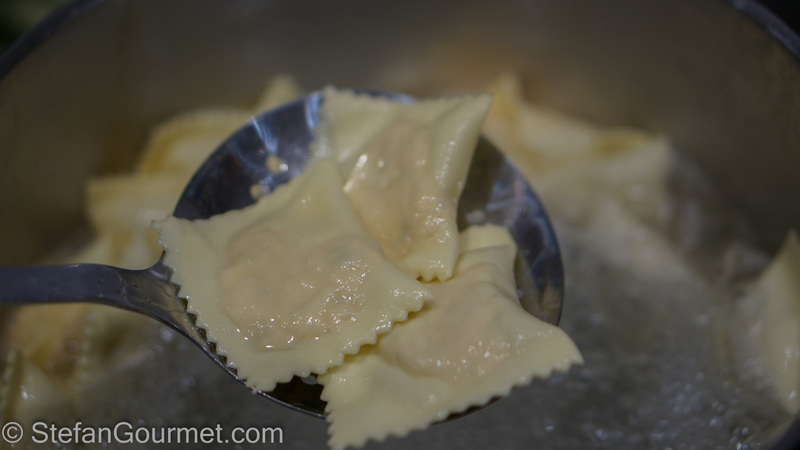 To cook them, plunge the frozen ravioli in boiling water straight from the freezer. Do not let them thaw first, as that would make them soggy. Frozen ravioli will require a couple of minutes longer to cook. Pasta is always referred to as “primo piatto”. You can serve appetizers before the ravioli and they would be called “antipasti”. Elegant vegetable or seafood-based antipasti would work best, as these shrimp ravioli are elegant so you wouldn’t want to precede it with something heavy. You can also serve a meat or fish after the ravioli, which would be called “secondo”. As the shrimp ravioli do not have a very assertive flavor, almost any secondo piatto would work.